This article is about the geometric shape. 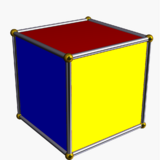 A cube is a three-dimensional solid object bounded by six square faces, facets or sides, with three meeting at each vertex. The cube can also be called a regular hexahedron and is one of the five Platonic solids. It is a special kind of square prism, of rectangular parallelepiped and of three-sided trapezohedron. The cube is dual to the octahedron. It has cubical symmetry (also called octahedral symmetry). A cube is the three-dimensional case of the more general concept of a hypercube, which exists in any dimension. while the interior consists of all points (x0, x1, x2) with -1 xi 1. A cube construction has the largest volume among cuboids (rectangular boxes) with a given surface area (e.g., paper, cardboard, sheet metal, etc.). 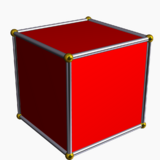 Also, a cube has the largest volume among cuboids with the same total linear size (length + width + height). The familiar six-sided dice are cube shaped. The analogue of a cube in four-dimensional Euclidean space has a special name—a tesseract or (rarely) hypercube. The analog of the cube in n-dimensional Euclidean space is called a hypercube or n-dimensional cube or simply n-cube. It is also called a measure polytope. In math theory you can also have lower dimensional cube. A 0th dimensional cube is simply a point. 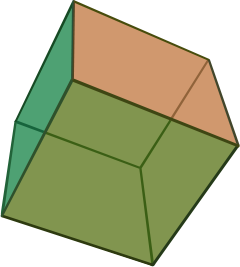 A first dimensional cube is a segment. A second dimensional cube is a square. One such regular tetrahedron has a volume of one-third of that of the cube. The remaining space consists of four equal irregular polyhedra with a volume of one-sixth of that of the cube, each. 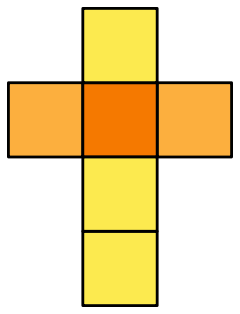 The figures shown have the same symmetries as the cube (see octahedral symmetry). An extension is the three-dimensional k-ary Hamming graph, which for k = two is the cube graph. Graphs of this sort occur in the theory of parallel processing in computers. ↑ English cube from Old French, Latin cubus, Greek kubos, "a cube, a die, vertebra." In turn from PIE *keu(b)-, "to bend, turn". This page was last modified on 24 November 2017, at 20:40.